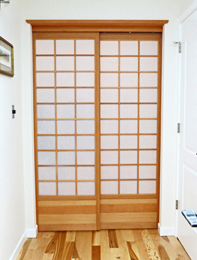 Shoji screens may be used as window coverings, room dividers, doorways, halls, light fixtures and lampshades: these very strong and light-weight structures have many applications. Americans prefer "Sandwich Shoji" which have kumiko grids on both sides of a rigid fiberglass panel made to look exactly like rice paper. Many patterns are available. 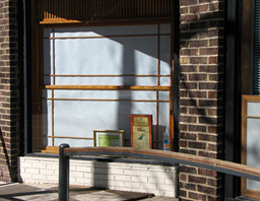 This is one of the simplest, a commercial application designed to shade customers from low winter sun. 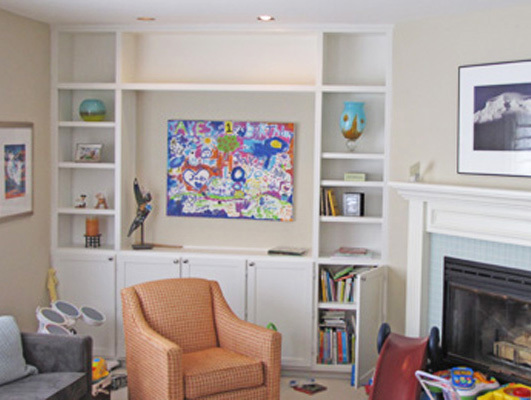 A built-in cabinet, designed for children's toys and books below and the mother's art work and collectables above. All our painted cabinets are made with birch plywood bodies and solid hard maple face frames and door frames, Blum hinges and Accuride drawer guides, primed and then painted with two coats. A Claro (California) Walnut Vanity for an Italian ceramic bathroom lavatory. All solid wood miters designed to bolt to the wall, open below. 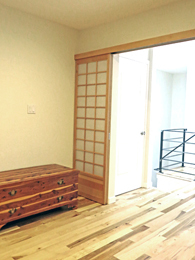 This Asanoha pattern, a classic element of Shoji design, is white oak painted black and incorporated into a redwood deck railing. Asanoha are amazingly strong. 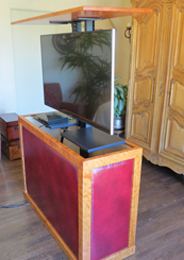 A Russian olive TV chest housing a Nexus 21 Television lift and flat screen TV. 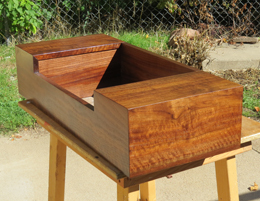 The cabinet has a black walnut Mission Style finish under clear lacquer. 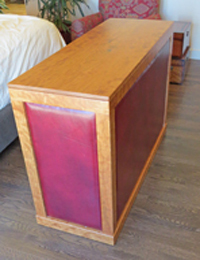 This Nexus 21 lift was done in mitered curly cherry and padded red leather. It includes the optional component shelf. 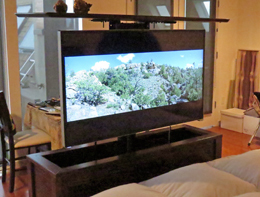 The lift used RF controls that may be operated through your TV controller for a single controller for all your devices and entertainment needs. 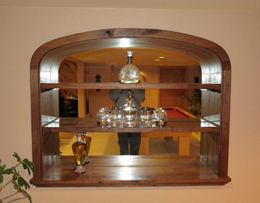 This mirror-backed black walnut liquor cabinet/hutch is ten inches deep and recessed into the wall. It has a natural Danish oil hand-rubbed finish. 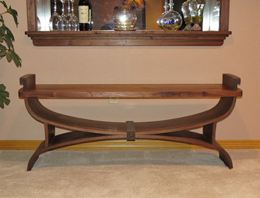 The two shelves are glass in slender walnut frames. 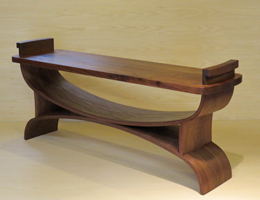 This black walnut bench was made with the same form as the hutch. The hand-fitted joints were secured with biscuits and concealed screws. 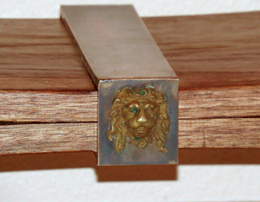 We commissioned a custom bronze bracket from McLean Forge with antique bronze lion-head for the junction of the two arched components. Bench and hutch together in the pool room, the bronze bracket secured from below with six brass machine screws. A cushion was later added. 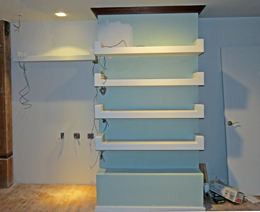 Five shelves of solid American Beech wood, 3" thick, designed to slide over concealed steel supports and wired internally for LED light strips. 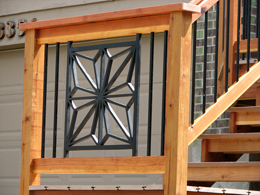 McLean Forge was able to fabricate precision-made steel brackets to our exact specifications. 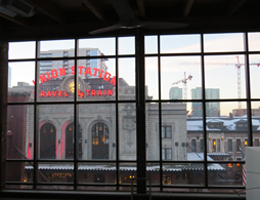 A project in downtown Denver, a fourth floor condominium in this recently gentrified neighborhood. 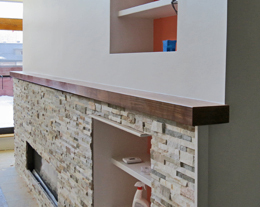 Working for an East Coast architect, we added 17 Beech wood shelves and a very long Black Walnut mantle. 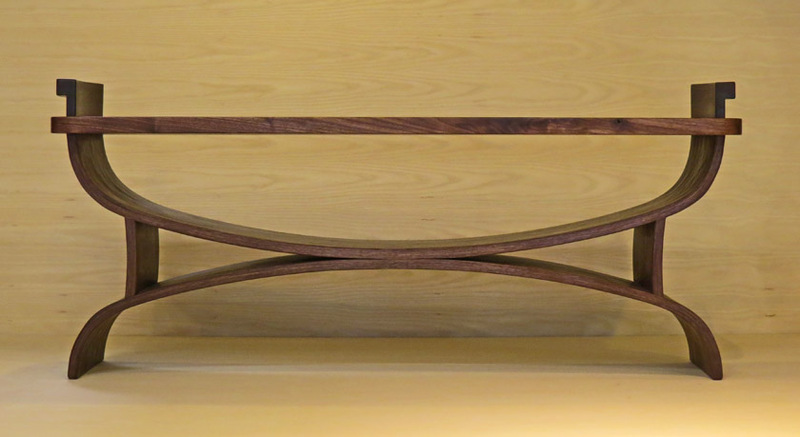 A Black Walnut mantle, measuring 3" thick, 7 1/2" wide and sixteen feet long. All solid wood miters, the front face rift-sawn and the top flat-sawn so as to appear to be a single huge timber. The core was an LSL 2"x 6" . 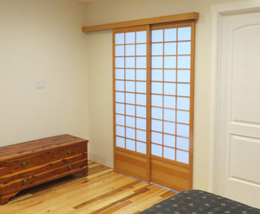 Our latest shoji, closing off a bedroom door in Gunbarrel. The wood is Douglas Fir. Each kumiko grid has 44 half-lap joints.